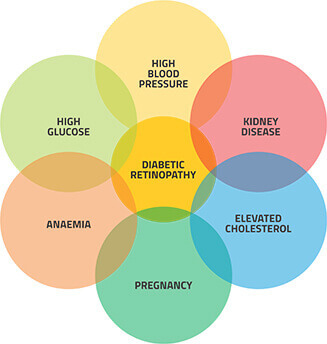 Diabetic retinopathy –Diabetes mellitus is a fast growing health hazard throughout the world. Indian has earned the dubious sobriquet of being the World capital of diabetes mellitus. The prevalence of diabetes has nearly doubled in the last 11 years and this number currently stands at 62.4 million (with another 77.2 million waiting in the wings and termed as pre diabetics) in our country. According to a study Hyderabad has emerged as the Indian metro city with the highest incidence of diabetes. The study estimated 16.6% of the population of Hyderabad has diabetes making it diabetic capital of India. A recent survey revealed only one third of the diabetic individuals know the evil effects of diabetes on the eye. Diabetes mellitus is a metabolic disorder characterized by high blood sugar. It can affect different parts of the body including blood vessels, heart, kidney, eye, foot and nerves. Diabetic retinopathy is due to damage to the small blood vessels present in the retina (innermost light sensing tissue of the eye). Poorly maintained blood sugar levels and duration of diabetes are the risk factors for the progression of diabetic retinopathy. Most diabetic patients are non insulin dependent (NIDDM or type 2 diabetics) and usually control their blood sugar with exercise and oral medication. The remaining are insulin dependent (IDDM or type 1 diabetics) and require insulin to regulate the sugar levels. Diabetic retinopathy is seen in both type 1 and type2 diabetes. The risk is increased when hypertension (high BP), renal disease (Kidney disorder), anaemia, obesity, impaired cholesterol levels, cardiovascular pathology (heart problem) or pregnancy coexist. Regular eye checkups (as diabetic retinopathy is asymptomatic unless the macula is involved) with suitable treatment when necessary significantly stabilizes the progression of retinopathy. Diabetic retinopathy unlike cataract usually takes its maximum toll amongst people in their fourth and fifth decades of life which usually coincides with their maximum period of productivity thereby robbing them of their full potential. This has ramifications with regards to their family in particular and the society in general as able bodied members are unable to deliver to their fullest potential. While management of cataract is generally a onetime affair, diabetic retinopathy necessitates a lifelong management similar to diabetes. And for an ophthalmologist, it is one of those situations where the systemic parameters need to be closely monitored. 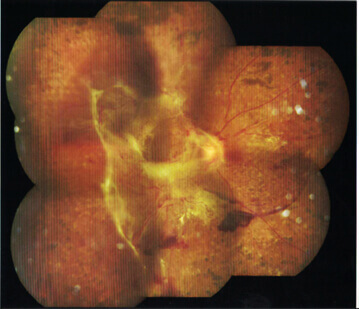 Diabetic retinopathy affects the blood vessels in retina. In the central part of the eye known as macula, the blood vessels become weak and start leaking resulting in fluid accumulation and swelling of the central part (macular oedema) while in the mid peripheral part of the retina, new blood vessels develop (which are structurally weak) to compensate for insufficient blood supply and have a greater tendency to bleed and tug onto the retina and cause it to detach. 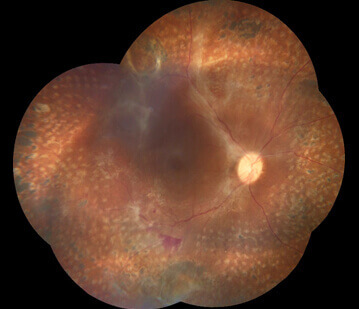 Patients may have decreased vision and sensation of “something floating” in the eye. Unfortunately, most of the patients do not have any symptoms until damage is extensive and sometimes irreversible. Hence it is advisable for every diabetic to get their eyes checked up comprehensively (and not stop at the customary assessment of spectacles) once every year till any such changes are noted and to have a more frequent eye check-up and any other management as per the judgement of the ophthalmologist once the changes have been noted. Needless to say, the earlier the condition is detected the better are the prospects in terms of vision and quality of life. 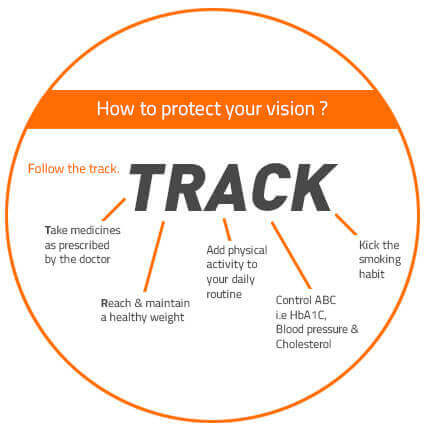 A diabetic person detected with no retinopathy or retinopathy in early stages only needs to have a regular eye check up along with a good control of Diabetes, hypertension, cholesterol and anaemia. This can be achieved by following the TRACK method. (See Treatment) This is a win win deal as the patient is not only ensured a better quality of life but is also protected from serious complications of uncontrolled diabetes and hypertension like myocardial infarction, cerebrovascular stroke, diabetic retinopathy and chronic kidney disorders. This is extremely important as prevention is an extremely cost effective option unlike management of complications which is seldom visually rewarding. Medical treatment of diabetes, hypertension and renal disease are important to slow the development and progression of diabetic retinopathy. 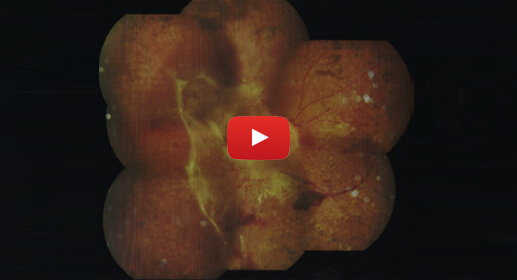 Laser treatment is indicated in maculopathy and proliferative diabetic retinopathy. It is an outpatient procedure and requires the pupil to be dilated to the full extent. Laser light is focused on the retina with the help of a contact lens, after anaesthetizing the eye with topical eye drops. 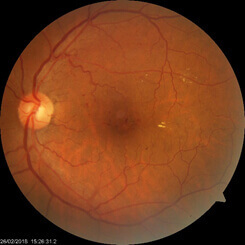 The goal in treating macular oedema in diabetic retinopathy is not to improve the vision but to stabilize vision by attempting to stop damaged blood vessels from leaking fluid into the retina. Small discrete areas of vessel leakage re treated with focal lasers and diffuse leakage is treated with a grid pattern. Vision may get little worse following laser for a short period. Most of the patients who receive laser for macular oedema maintain better vision than those who had not received any treatment. PRP or pan retinal photocoagulation is done to treat the abnormal new vessels. Peripheral retina which is not receiving adequate blood flow is treated by laser to halt the new vessel formation is divided into three or more separate sessions. The laser helps to prevent severe visual loss occurring due to complications (Vitreous haemorrhage, Retinal detachment) of diabetic retinopathy, though it does not improve the lost vision. 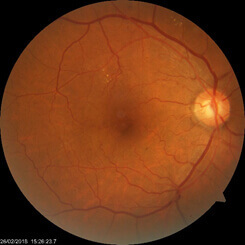 Diffuse macular oedema and focal oedema not responding to laser treatment require intraocular injection of steroids or anti VEGF agents (bevacizumab /ranibizumab/VEGF trap). Studies with anti VEGF agents showed promising results with excellent safety profile. The drug lasts for about 6 weeks in the eye after a single injection and may need to be repeated if the disease reactivates. Similarly, intravitreal long acting steroids have shown promising results in controlling diabetic macular oedema, however they carry risk of increasing intraocular preassure and cataract progression. A person may have bleeding before the application of laser or rarely the diabetic retinopathy progresses even after laser treatment. Majority of vitreous haemorrhage clears by six weeks by absorption of the body. Vitrectomy surgery is indicated to remove vitreous hemorrhage if it is not absorbed within 6 weeks. The procedure is also done for treatment of tractional retinal detachment due to scar tissue formation. Vitrectomy is performed in the operating room after anaesthetizing the eye with local anesthetics. It is one to two hours procedure and the patient can go home the same day.